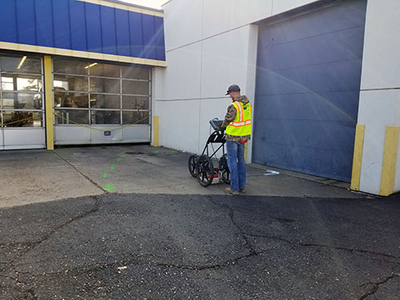 Ground Penetrating Radar Systems of Denver, CO was contacted by a contractor to locate known and unknown utilities prior to boring for soil samples at an auto repair store in Northglenn, CO. The customer was looking to excavate and avoid striking any known and unknown lines while digging. GPRS arrived on site without delay using standard locating techniques as well as utilizing GPR for a more thorough sweep of the entire area, limiting any surprises of costly repairs and/or safety concerns. Ground Penetrating Radar Systems specializes in ground penetrating radar service and is our primary source of revenue. With that in mind, the amount of experience and specialization of subsurface imaging and investigations as well as a nationwide network of project managers; GPRS, LLC. is unrivaled in the Ground Penetrating Radar industry. GPRS, LLC. can supply your project with the most accurate ground penetrating radar service in the business so you can rest easy in knowing that any safety concerns will be eliminated. Your safety and job efficiency is our main goal at Ground Penetrating Radar Systems. If you are interested in learning more about our subsurface imaging capabilities or other Ground Penetrating Radar applications such as locating reinforcement and conduit in concrete slabs, locating underground storage tanks (USTs), clearing boring locations of possible Utilities for soil samples, void detection or even structural investigations. Don’t hesitate to contact us for a demo or lunch and learn – let us buy your team lunch so we can tell you more about our company and what we can offer your company and projects. Ground Penetrating Radar Systems has an office local in Denver, CO serving all of Colorado and Wyoming. Ground Penetrating Radar Systems also has offices in nearly every major city in the United States. Contact Ryan Shannon (Project Manager) at (303) 913-8630 or ryan.shannon@gprsinc.com today to schedule an appointment or free demo or if you have any inquiries.